Sala's ex-girlfriend: "Investigate the soccer mafia because I do not believe this accident"
"Investigate the soccer mafia because I do not believe this accident," wrote Berenice Schkair, the former model girlfriend of Emiliano Sala, the Argentine footballer who is not known. 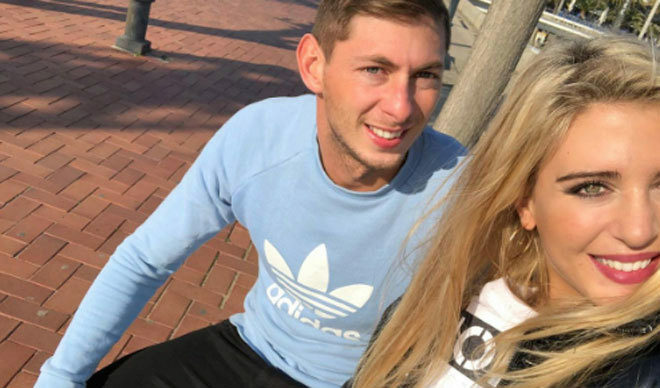 The shuddering audio of Emiliano Sala from the plane: "It seems that it will fall apart"
"Investigate the soccer mafia because I do not believe this accident," wrote Berenice Schkair, the former model girlfriend of Emiliano Sala, the Argentine footballer whose whereabouts are unknown after the disappearance in the English Channel of the plane in the one that traveled. The model tweeted this disconcerting message on her Twitter account several times as well as on her Instagram account, outraged by the suspension of search efforts for the plane flying from Nantes to Cardiff. On Tuesday night he modified it, reports the Argentine newspaper Clarín . On Instagram, Berenice's message spread further. There he attached videos and photos of a trip they both made in Europe. "I want to wake up and this is all a lie. #Emilianosala Please investigate because I do not believe this accident or suspend a search for bad weather when they hardly find objects floating in . I need to read that you showed up I can not believe they stop the search until tomorrow Let them waste time and do not investigate. I feel helpless. It's a nightmare, "he writes. "I can not stop thinking about you Emi, dreams have an expiration date, in a second your life can change, we are dust, we are ephemeral in this universe, where so many injustices occur, and for this reason what I regret most is not telling you that you made me feel like I felt a long time ago and that I want to face you again, I do not know how to express myself and that is something that I think I am going to learn from now on. Those who know me know the brightness in my eyes when I talk about Everything changes today in the morning and I still do not fall down, why do these things happen, because such a fascinating man full of hardworking projects, good person and dedicated to his work, these setbacks happen to him, because dreams are not fulfilled? broken heart I still can not understand it Appears with force as always I'm broken I feel pain, fear, rage and I have helplessness I can not do anything Force as always Emi I know that yes You are strong We are waiting for you @emili anosala9 ", concludes. The search has resumed this morning, as announced by Guernsey police, reports AFP. "We have resumed the search, two planes are taking off and we will focus our search on a specific area where, in our opinion, we have the best chance of finding something, based on the study of the tides and the weather since the plane disappeared," he tweeted. around 07:30 GMT to the police. "Hello, little brothers, how are you doing?" Brothers, I'm dead, I was here in Nantes doing things and things and things and it did not end ... I'm here on top of the plane, which seems to be falling apart and I'm leaving for Cardiff, it seems that tomorrow, we start in the afternoon, we start training with the new team, to see what happens, "was the last Whatsapp audio message, jokingly, that Sala's friends heard, which turned out to be premonitory.